Ever since the invention of the car, Mercedes-Benz has maintained its dominance over the automobile industry. 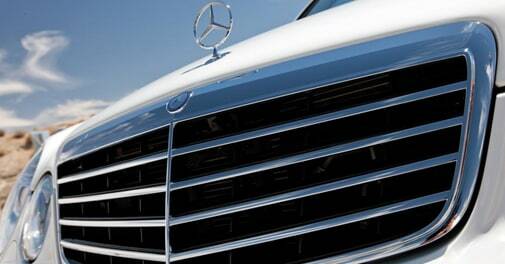 Think luxury cars, think Mercedes-Benz. Part of the 'German Big 3' automakers, the company traces its roots to the very first petrol-powered vehicle - the Benz Patent Motorwagen. It has come a long way since then, right through World War II in the 1930s (Adolf Hitler riding bulletproof 770s in scratchy black-and-white photographs) to the taking of Saddam Hussein's beloved 600 Landaulet in the 2003 Iraq invasion. Whether it's the invention of the diesel-powered automobile in 1936 or the incorporation of the 'crumple zone' in a vehicle in 1959, they were responsible for the most important milestones in the motoring world. The CLA 45 AMG, with an all-wheel drive and driving characteristics of a sports car, is said to embody driving performance at its very best. Underlying the growing significance of the increasing AMG customer base, Mercedes-Benz India unveiled the CLA 45 AMG - a unique car with an overtly evident AMG DNA. A high-tech package that includes the most powerful series-production four-cylinder engine in the world as well as performance-oriented AMG 4MATIC all-wheel drive, the CLA 45 AMG is said to embody driving performance at its best. The combination of high performance and torque, along with the performance-oriented AMG 4MATIC all-wheel-drive system, gives the CLA 45 AMG driving characteristics almost on a par with those of a sports car. Boasting of an AMG 2.0-litre turbo engine with a maximum output of 360 bhp and up to 450 Nm of torque, the car is capable of accelerating from zero to 100 km/h in 4.6 seconds and achieving a top speed of 250 kmph. Other highlights include a gravity-die sandcast all-aluminum crankcase, weight-optimised crank assembly with forged steel crankshaft, air-to-water intercooler, alternator management and ECO start/stop function. 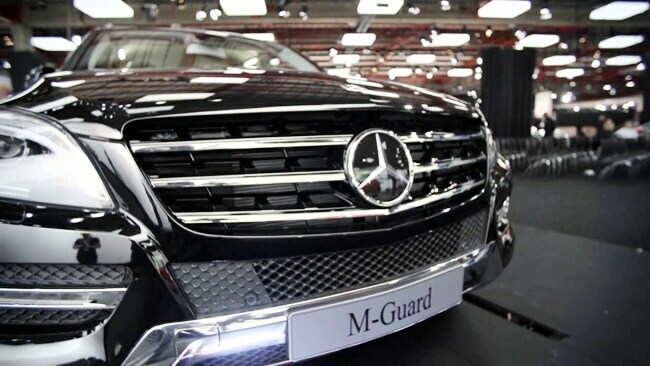 The armoured M-Guard meets all the requirements of protection level VR4 without taking a toll on its ride quality. 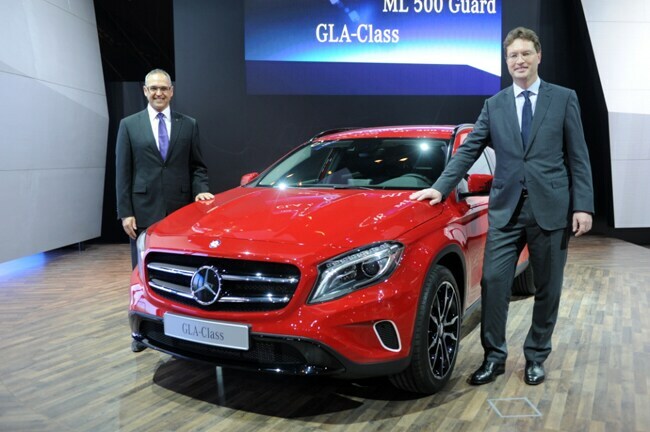 In a strategic move to expand its new special-protection variant vehicles to the SUV segment, Mercedes-Benz India unveiled the latest addition to the extensive Mercedes-Benz Guard family - the M-Guard. The new car meets the requirements of protection level VR4, according to testing guidelines BRV 2009 for special-protection vehicles with bullet resistance (according to Bullet Resistant Vehicles 2009). However, despite the increased weight caused by its armour, the M-Guard achieves the ride comfort and agility of its series-production counterpart. The special-protection variant features an AIRMATIC air suspension system with Adaptive Damper System (ADS), specifically adapted to the vehicle's special protection features. Stronger axle components compensate for the increased weight of the M-Guard, and torsion bars at the rear axle optimise roll behavior in fast curves for instances of evasive action. Priced at Rs 2.49 crore (ex-showroom tag) in Delhi. A compact luxury SUV from the Mercedes-Benz stable, the GLA Class combines dynamic styling with innovative thinking. 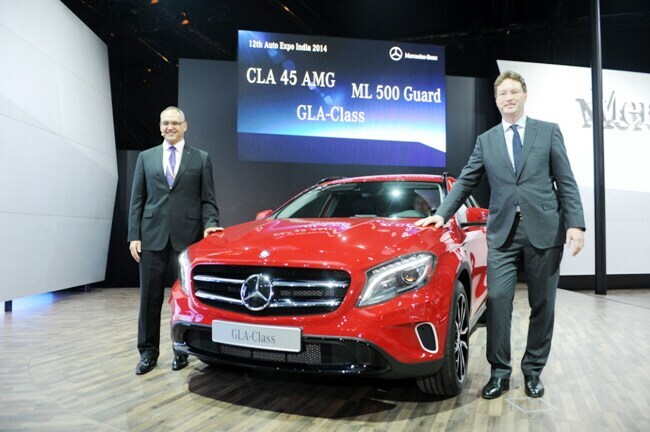 A compact luxury SUV that combines dynamic styling with clear benefits for recreational use, the GLA Class marks a new approach for Mercedes-Benz in India. A vehicle that aptly showcases the innovative thinking that went into its designing, one can't help but notice how the muscular appearance of its exterior seamlessly seeps into its interiors. A particularly high perceived quality is achieved by the contours, choice and combinations of high-grade materials, and all trim surfaces are galvanised in silver-shadow for material authenticity - resulting in a metallic finish with a "cool-touch" effect. The premier variant in GLA Class houses a 2.0-litre turbo-charged engine capable of belting out an admirable 210 BHP of power and 350 Nm of torque.